January is Learn to Ski and Snowboard Month nationwide, and we know that there is no better place to experience the thrill of learning to ski or ride than in its original state. Here in Vermont, we have some of the best instructors in the world and plenty of terrain for those starting out. Learn to ski and ride month isn't only for those who have never been on snow before. 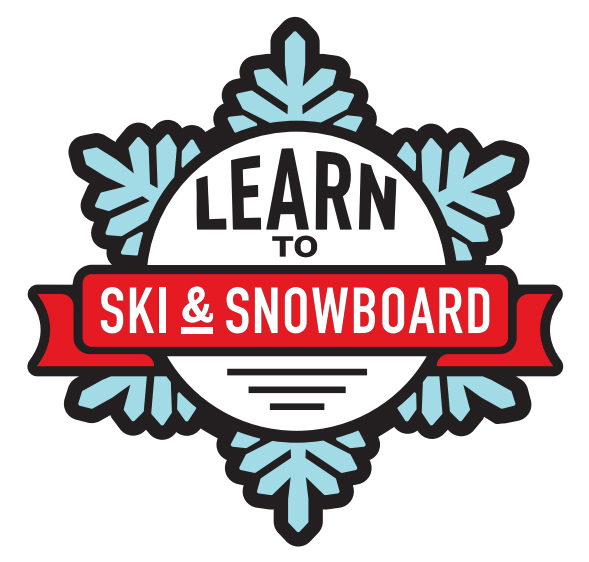 You can also learn a new snow sport through Learn to Ski and Snowboard Month. Ski Vermont is once again offering a $49 package for beginners including a beginner area lift ticket, professional lesson and rental in January 2019. In the spirit of spreading the love of winter to new enthusiasts, the majority of our member resorts will be offering $49 beginner lesson during the month of January, excluding Holiday periods. The beginner package includes equipment rental as well as a lesson with a professional instructor (lesson duration varies by resort) and access to the beginner terrain. Due to the deeply discounted price, we will only offer one beginner package per person. These packages are for BEGINNERS ONLY and for the 2018/2019 season. See participating resorts with details and instructions for reserving your lesson below. Most reservations must be made 48 hours in advance of the desired lesson start time. Learn to Ski available for ages 4 and up, Learn to Snowboard available for ages 6 and up. To purchase a ski package, click here. To purchase a snowboard package, click here. Learn to Ski and Snowboard for ages 13 and up. Learn to Ski and Snowboard for ages 5 and up. To purcahse a snowboard package, click here. Learn to Ski and Snowboard for ages 7 and up. To purchase, visit stratton.com . Bolton Valley’s 3-Day Learn To Love It Program includes three days of beginner lessons, giving guests a solid start on skiing or riding. Upon completion of the third lesson, skiers will receive the Learn To Love It card which entitles the cardholder to 50% off of full day lift tickets, lessons and full day rentals for the remainder of the 2018-2019 season. Kids rule (and learn!) at Bromley Mountain in Kidsrule Mountain Camps. Perfect for absolute beginners to bump fiends, the all-day program for ages 5-12 combines safety, education and fun to get kids started off on the right boot. It’s just $175 per day with lift ticket, lunch and snacks included. Six Packs and Three Packs of lessons may be available at certain times of year, and all beginners – kids and adults – enjoy learning to ski and ride in the specially crafted Terrain Based Learning Zone. Bromley combines carefully sculpted slopes, rollers and banked turns for faster and easier fun. 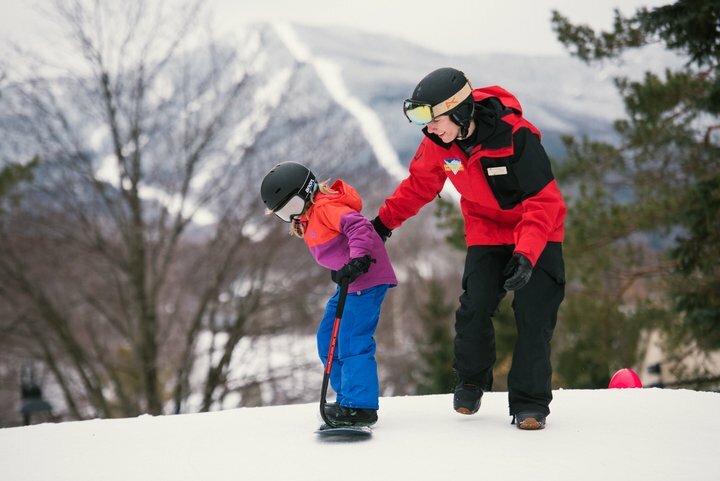 Back by popular demand, Killington’s 4-Day Learn to Ski/Learn to Ride Discovery Program gets new skiers and rider free gear to ensure they become lifelong skiers or snowboarders after lessons are complete. Skiers receive Elan E-Rise skis and snowboarders get a board and bindings from our Vermont neighbors at Burton Snowboards. Skiers and riders can also introduce a friend or family member to skiing and riding and earn a FREE lift ticket for themselves through the Bring-A-Friend promotion. Specifically designed for adult first time skiers, Mad River Glen has a package that includes a beginner lift ticket, equipment rental and a two-hour group lesson. For an ideal learning scenario, beginners might consider doing a private lesson and getting one-on-one attention. This package is available for Alpine or Telemark skiing and the cost is $80 for the package and $50 for the second two-hour clinic. Magic is launching its new Nelson Family Learning Center Area in a beautifully manicured beginner slope set away from high traffic areas so beginners can relax and enjoy the personal instruction by PSIA-certified school professionals. A new magic carpet style conveyor lift will be installed this fall to create the easiest way to access the beginner and learning slope. Magic has special lesson deals for first time skiers such as its “Never Ever” Kids Learn-to-Ski with 3 half day lessons for only $189 and “First-Timers” for adults at $199 which includes Learning Zone tickets, lessons and rentals for the 3 days. Okemo’s First Tracks learning package is offered daily for first-time skiers and snowboarders 7 and older. A great value at $100, it includes a complete equipment rental package, a group lesson and unlimited use of Okemo's lower mountain lifts for the day. Okemo’s Double Tracks learning program builds on the skills learned in the first lesson by offering more instruction during another lesson the next day for $190. A same-day additional third lesson for Double Tracks participants may be added for $55. Skiers and riders can enhance and perfect their skills during a private lesson with a Snow Sport professional for an hour, a day or the whole season. The Learn to Ski and Ride program is available every day and includes newly tuned rental equipment, “Learning Zone” lift access, and a 1 ¾ hour lesson with a Snow Sport Professional starting at just $109. Book in advance for the #go5 Lesson experience, which guarantees there are no more than 5 skiers per group lesson. Sugarbush's First-Timer-to-Life-Timer Program offers three consecutive group lessons including rentals, instruction, and a lift ticket, followed by a FREE All-Mountain Season Pass – a $1,779 value – to those who complete the program. The First-Timer-to Life-Timer program is offered throughout the season, but during the month of January, the $49 first time lesson can be bundled into the price of the program, bringing the total cost down from $280 to $224. The Snowsports School at Suicide Six is one of the oldest continually operated schools in the nation. Offering private ski and snowboard lessons, they invite you to learn a new sport. Offering private lessons only to First Timers this personalized instruction allows the student to progress at a comfortable pace without the pressure of a group dynamic. Experience the First Time on Skis/Snowboard “Adult” Offer in a 2-hour private lesson with rentals & JBar pass all for $159. Must be first time Adult (over 18). Space is limited and based on availability and lessons must be reserved in advanced. (48 hours). Holiday Rate $199 (based on availability).